The Ipswich to Manningtree roads cuts off a long tongue of land from the rest of Suffolk. As the great Rivers Orwell and Stour roll towards the sea, the edge inexorably closer to each other, until at Shotley gate they meet before emptying into the North Sea. This huge natural harbour is now home to England's largest container port, but you wouldn't think anything of the kind could be so close in the gentle woods and lanes of the Peninsula, except for the cranes which occasionally peep above the treetops, of course. The setting of St Peter is idyllic: you head down through Holbrook, and then into the woods. It sits in a close with several awesomely grand houses for company, and the Stour estuary is below, wild Essex beyond. The appearance of the church is a little unusual, and requires some investigation. This is one of the south towers found commonly in the Ipswich area. No south aisle was ever built beside it as at neighbouring Holbrook, but several successive Victorian restorations saw the addition of a long south transept which contains an organ chamber and a vestry which is largely invisible from inside the church, and the rebuilding of the chancel with the addition of a north aisle and transept. But the original tracery of the chancel east window was moved into the chancel aisle, which explains why such an overwhelmingly 19th century extension has a medieval window. None of the restorations were the work of a major local architect. There seems to have been a rolling programme of refurbishment throughout the 1840s and 1850s, probably at the behest of a Tractarian-minded Rector. The two major restorations came in the 1860s and 1870s, and although Richard Phipson, as Norwich Diocesan Architect, certainly oversaw the work, the combination of, first, Hawkins of London, and then the firm of Francis, has left something unusual and interesting. Stepping inside, this is an almost-entirely early Victorian interior of some high quality. The furnishings are the work of the great Ipswich woodcarver Henry Ringham, who, despite going bankrupt after overspending on his infamous Gothic House, was still sufficiently highly thought of some decades after his death to have an Ipswich road named after him. If they really date from 1842 then they are the major example of his early work. An outstanding feature of the west end is Stutton's millennium window. These were installed in many churches at the turn of the century, and are too often kitschy and dull. No such charge could possibly levelled against Stutton's. The window is absolutely outstanding of its kind, at once enthralling, theologically articulate and inclusive. The artist was Thomas Denny, whose work is more familiar in the west of England. The upper part depicts a passage from Isaiah: And a man shall be as an hiding place from the wind and a covert from the tempest; as rovers of water in a dry place, as the shadow of a great rock in a weary land. And the eyes of them that see shall not be dim and the ears of them that hear shall hearken. The lower part depicts the counterpoint passage from the book of Revelation: And he shewed me a pure river of water of life, clear as crystal, proceeding out of the throne of the Lamb. In the midst of the street of it, and on either side of the river, was there the tree of life, which bare twelve manner of fruits, and yielded her fruit every month: and the leaves of the tree were for the healing of the nations. Either side of the west end are memorials to 17th century Jermys. These are rather striking - they were moved here at the time the chancel was rebuilt, and depict Sir Isaac and Lady Jane Jermy on the south wall, with their son Sir John and Lady Mary Jermy opposite. The verses are well worth a second glance for an insight into 17th Century eloquence. A remarkable memorial from more than a century earlier is at first sight rather unexciting. It is under the carpet at the east end of the nave, commemorating John Smythe of Stutton Hall, who died in 1534. It is a brass plaque in English, reading O(f your charity pray for the soule) of John Smythe, Knight. John deceased the XIIIIth day of August in the year of Our Lord MCCCCCXXXIIII O(n his soul)e Jesus have mercy. There is no figure, no heraldic devices, no trimmings at all. So what makes it so interesting? Well, at some stage, probably in the late 1540s, possibly in the early 1640s, or perhaps at some time between or shortly afterwards, all the parts of the inscription that reflect Catholic theology and doctrine have been viciously raked out, with either a sword-tip or chisel. So, we have lost f your charity pray for the soul and, at the end, n his soul. A fascinating document of the protestant intolerance of early modern England. The chancel has been reordered in a curious manner. The rood screen is almost certainly also by Henry Ringham, making it a work of some significance, and was installed here before the chancel arch was rebuilt in 1862. It has been set further east, with the altar brought forward, and now provides an elegant backdrop to the sanctuary. All the 19th Century glass is worth a look, being a record of work through the decades of the 19th century. 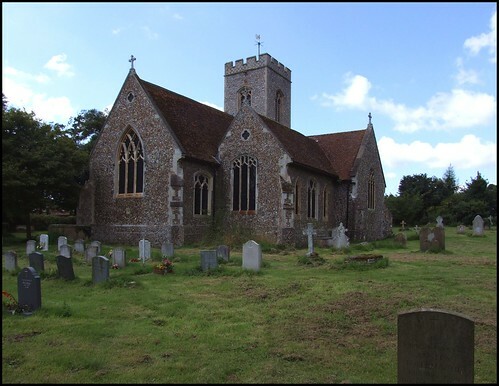 Some is the 1840s work of Charles Clutterbuck, which as Pevsner points out makes them rare survivals in Suffolk. As often on the peninsula, the church suffered blast damage during the last War and several windows are lost, but these losses are recorded in their replacements. The Ward & Hughes-style window of St Helen and St Peter appears to date from the 1850s, and if so it is a remarkably early example of such a thing in Suffolk, where such papistry would have been controversial until well into the 1860s. Powell's glass of the post-Resurrection Christ greeting his Disciples on the shores of Galilee of a couple of decades later must have struck a chord of familiarity in this coastal parish, and remains a good example of the workshop's early work in Suffolk. There is more good work in the north transept and chapel, but unfortunately this is now used as a meeting room, and is kept locked. You can see it through the glass partition, but it is impossible to photograph. Otherwise, this is a interesting and welcoming church, with a beautiful setting and a strong sense of continuity.